Roasted Seafood Shop info about the game-Games2Rule. 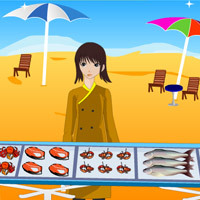 You are running a brand new roasted food shop near the sea. There are so many customers coming in, and they all want to get their orders really quickly. So serve them like costumers demands. You need to reach the target in each level before your time runs out. You have to seat customers, take their orders, bring them their roasted food in limited time, and you have to do everything quickly because times going fast. Good Luck Have Fun!